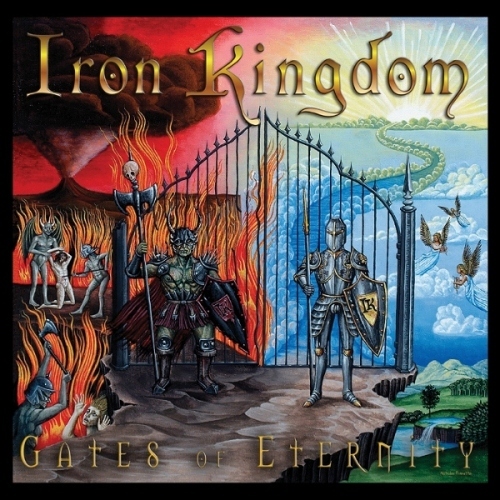 I found out about Iron Kingdom recently, hence why I'm only just now reviewing their second album 'Gates Of Eternity, which came out over a year ago. I'm certainly kicking myself for not hearing about them sooner though but I intend to make up for that poor lack of judgement! Iron Kingdom, a four piece from Surrey, British Colombia, Canada are a full on New Wave Of Traditional Heavy Metal band but with an original twist! That twist is lead vocalist & guitarist Chris Osterman who sounds like a young Geddy Lee. Yep, Iron Kingdom do the almost impossible and sound like a fabulous combination of Maiden and Rush. If the classic NWOBHM bands and many of their modern day counterparts such as Neverworld, Elm Street, Ruthless Steel, Enforcer, Holy Grail, Toledo Steel etc tick your boxes then I implore you to check out Iron Kingdom. 'Gates Of Eternity' is an absolutely fantastic album and they are way beyond their years! Joining Chris are his sister Amanda Osterman on Drums & Backing Vocals (believe me, there is no nepotism here, Amanda is an immense drummer), Leighton Holmes on Bass & Backing Vocals and Kenny Kroecher on Lead & Rhythm Guitars. Together they really have come up with something a little bit different and even though it's obvious they have one foot in the past they have also firmly planted a large size 12 boot in the present and future. All it took me to start smiling was listening to about 20 seconds of opening track 'At The Gates'. That song is a very assured way to open an album! 'Chains Of Solitude' comes next and this is the song where I began to realise what a good singer Chris is and the 'Geddyisms' launched at me like rockets from all directions. I really don't think he would have any trouble dealing with any Rush track and that's not something you'll hear me say very often. It's not just him though, the whole band is very strong and they really feel like a proper collective that feed off of one another. From the beautiful piano piece 'Candeloro' up to the centrepiece and fifteen minute plus majesty of 'Egypt (The End Is Near)' every song is a stormer! Over the years Canada have delivered some wonderful bands (I can almost forgive them for Nickelback!) and Iron Kingdom are another to add to that list of more well known names. Although, unfortunately, due to our fickle nature with Metal and Rock the UK will always be a niche market for them Iron Kingdom will undoubtedly go down well in Mainland Europe and Greece where Trad Metal is well catered for. If you go to their merch store you'll not only be able to get CD's but also cassette versions of both their albums, which is a great touch! I'm off now to get their debut album from 2011 'Curse Of The Voodoo Queen' and am already very much looking forward to seeing what they can come up with next!